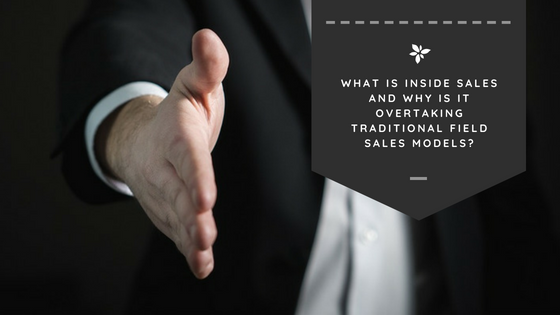 What is Inside Sales and Why Is It Overtaking Traditional Field Sales Models? Inside sales has changed the way that B2B companies sell to prospects. Over the course of the last decade, the sales strategy has seen fast-paced growth, especially when compared to more traditional outside sales positions. Today, traditional sales positions still make up more than 70% of the total industry workforce in North America, but the rapid adoption of inside sales programs is slowly but surely eating away at these numbers. In a recent survey that asked questions of the Vice President’s of Sales at a number of companies and determined that 46% of them reported that their company was currently in the middle of a shift away from more traditional sales strategies toward more inside sales positions. Traditional sales positions will never go away completely. They are still the practical, more useful choice in many situations. Nevertheless, the trend is clear and companies should be paying attention to the benefits that they could enjoy from embracing inside sales. Inside sales is all about building relationships with customers. Instead of looking at a single individual within a company that you are selling to as a prospect, the strategy focuses on all stakeholders within the company as a target account. This places the focus on the needs of all decision-makers, not just getting on of a number of people on board. Sales teams are constantly under pressure to increase sales while limiting their budgets in their departments. One of the benefits of inside sales is that it typically costs less than more traditional sales positions. A recent study found that inside sales teams generate new customers at just 40%-90% less cost than a traditional field sales rep who may be forced to take meetings, fly to meet prospects, and generally spend more money on the sales process. This lower average salary not only helps teams save money on generating sales, but also the team salaries tend to run lower than they would on a traditional sales team. Running an inside sales team would be impossible without the right kind of tech by your side. The strategy requires that you are able to track every single interaction with a prospect across different employees, marketing materials, and conversations. It wasn’t until recently that that kind of technology was available and cost-effective for smaller companies. Today a sales rep can skip the face-to-face meeting and the flight to get there and instead hop on Skype or another video conferencing solution and have the same level of success. Customer relationship management solutions have made it possible for companies to accurately track all interactions with a customer and use those interactions to inform their inside sales strategy. Inside sales is done remotely, thus the name “inside.” In order for the strategy to be effective, customers had to be comfortable with buying products after interfacing with someone through remote communication solutions. Using software for video conferencing, text messaging and email, and online-only conferences were not the norm ten years ago and would have certainly caused some serious problems if they had attempted to adopt the strategy then. Today, buyers are accustomed to the tools and processes used in remote buying. This familiarity has made the strategy a viable one for companies of all sizes and opened up markets that otherwise would have been extremely costly for companies to tap into. Without these innovations, the strategy would not be possible. Another reason for the growth inside sales is that the strategy calls for a serious focus on training and development within their teams. In traditional sales teams, reps spend a lot of time out of the office trying to make sales and taking meetings. When most of the selling takes place within the office, that makes it easier for a company to schedule time for training and grow their skills as a group. Managers have much more control and insight into their teams in inside sales positions. CRM solutions and other tracking tools allow them to have a bird’s eye view of how each member of their team is performing and help them to identify areas for improvement. The inside sales strategy makes teams more flexible. The cost per meeting with each prospect is much lower than in traditional field sales positions, and tools can help reps to maintain relationships with their prospects. This helps sales reps to specialize more easily and really dig into a specific part of the process. Inside sales teams have more specialized positions because of the flexibility that the strategy provides. Companies often have problems with marketing and sales alignment. It’s something that every company knows would be to their benefit, but so few manage to pull it off. Inside sales is extremely transparent and requires collaboration between your marketing and sales teams, facilitating alignment between them. Every new contact — whether a text message, missed call, opened voicemail, or Facebook message — is tracked and attributed to the correct customer. Those interactions influence both your marketing and sales teams. Inside sales has really caught on with B2B companies over the course of the last decade and we can expect to see that trend grow. The wealth of software solutions to augment the strategy have made it cost-effective for companies of all sizes. Today, more companies than ever before are using inside sales to grow their sales and create more aligned marketing and sales operations.